FlowTech Afterburner Mufflers give you a reliable high-performance muffler with an awesome sound! The 14" L x 10" W x 4" H aluminized case offers plenty of room for large low-restriction flow tubes and no resonance rumble-inducing sound chambers. 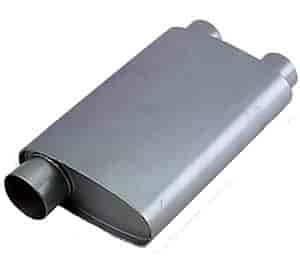 These mufflers are fully reversible, providing plenty of installation options in a competitively priced package! Does Flowtech 50371 fit your vehicle?